"41HS13, 2003.08.241, Burial 2" by Timothy K. Perttula and Robert Z. Selden Jr.
DECORATION (INCLUDING MOTIF AND ELEMENTS WHEN APPARENT): The rim has an engraved oval panel repeated four times around the vessel, and there are tick marks on the upper, lower, and side portions of each panel. The panels are divided by hatched brackets. 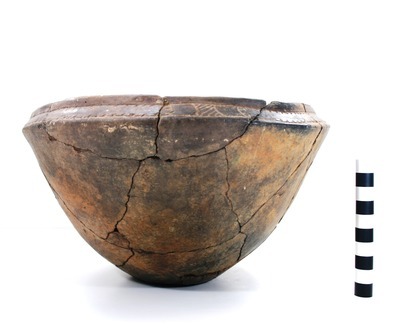 Simms Engraved carinated bowl, Burial 2, Susie Slade site.